I'm all for making life easier. So when I discovered the Gillette Venus Breeze, I simply had to give it a whirl. This razor has built-in shave gel bars that literally make the need for shaving cream irrelevant and unnecessary. And while I went into my shower on Sunday thinking there was no way this could possibly end well, I still figured I should test it out. And all I can say is, WOW. This razor really works. All you have to do to make the shave gel start coming off the razor and onto your legs is to wet it down slightly. I was pleasantly surprised by the amount of shave gel that actually lends itself to the leg. While it's not as much as I normally out of the can, it's just enough to make the shave so smooth, it's been three days and I still don't have to shave again! Even harder-to-smooth-out areas like my knees and ankles are now fuzz free. I honestly can't see anything bad about this razor. The Venus Breeze is definitely my new best friend. 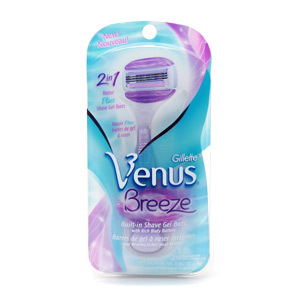 The Gillette Venus Breeze retails for around $12 at drugstore.com.